After years of dating the wrong ones and a few heartaches in between, you find yourself with a ring on your finger and a vision of a new life together with your significant other. Getting engaged to the person you love marks the beginning of a new chapter, and it also means spending the next couple of months planning every single detail of your wedding. Making this announcement to friends and family is one of the key responsibilities to accomplish within this period. There are many ways to do so, depending on the type of stationery you opt to use. As one of those spur-of-the-moment decisions, there are stories of couples who get married without informing the people who deserve to know about the whole matter. Getting married behind someone’s back is pretty common in some states, especially when two individuals had too much drink after a hazy night in the neon-soaked Strip of Las Vegas. Although there’s nothing wrong about waking up one morning and asking your partner if they’d want to elope, it’s still a good idea to inform some of your friends and family about the marriage through a wedding announcement. A formal ceremony and reception can always come after the union has been legalized, as long as you take the appropriate measures to finalize it. 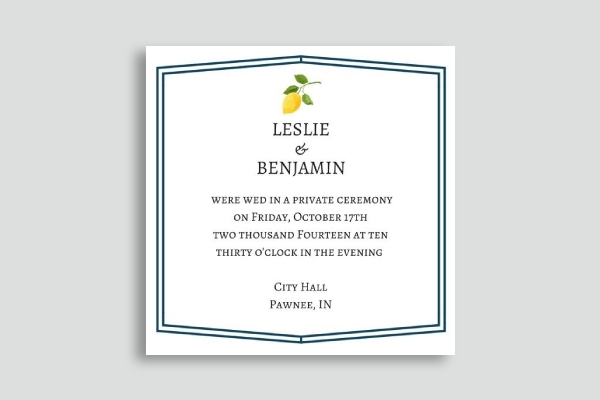 While there are various ways to craft your announcement card, nothing screams “wedding” more than a floral design does. 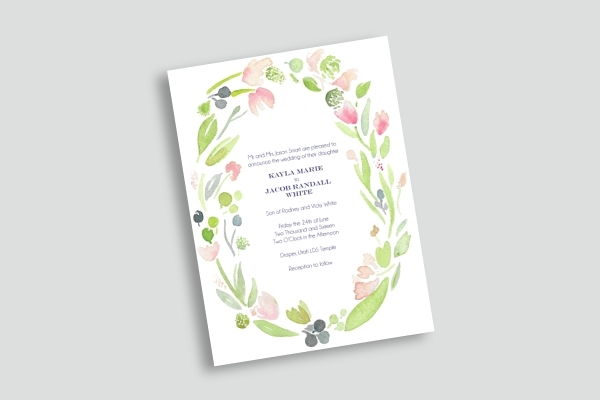 Get inspired by this floral wedding announcement to design your own card from scratch. You can add flowers to obtain a sophisticated look with your card, which is sure to catch the attention of your recipients. Feel free to incorporate your own style and preference into the card to achieve a more personalized outcome that people will remember. Couples who have the funds to organize a large celebration for a formal wedding often go all out with their event stationery. 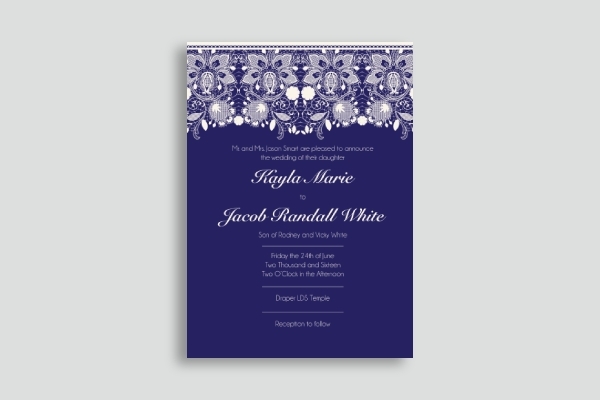 This lace design is a prime example of an elegant wedding announcement that’s sure to impress your audience with its smooth curves and white patterns. 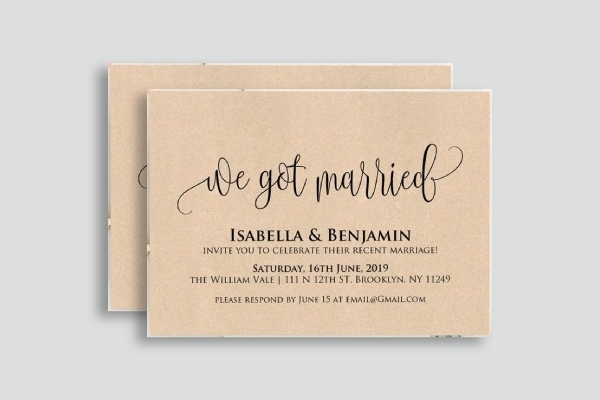 A good font selection can even make the announcement card even more captivating for you to celebrate the sacred union in style. When it comes to making a wedding announcement, there’s no point in complicating things. A simple design that goes well with the theme of your wedding can do the trick just as perfectly as a professionally crafted artwork. 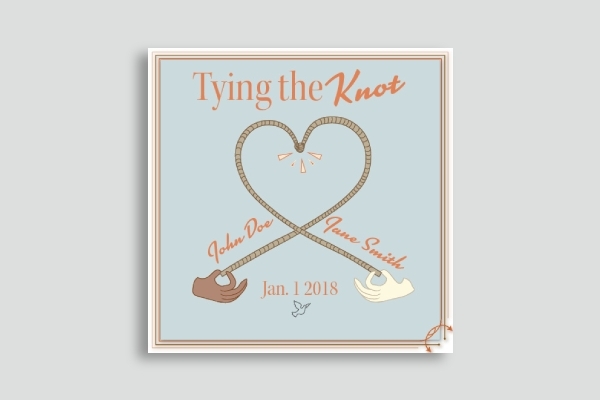 You can utilize the announcement design as a sticker for the envelopes carrying your invitation cards, or you can even use the stationery as a decoration for your rehearsal dinner. It’s a clever way to make a positive impression with your guests without having to burn a hole in your wallet. Social media has helped us stay in touch with people who might have moved away a long time ago or with those whom we don’t get to see very often due to our busy schedules and personal priorities. But even then, not everyone is too keen about sharing their private moments on a platform as public as Facebook or Twitter, which is why we often find out about important milestones in a person’s life weeks after they happen. This is usually announced through a simple post that communicates the details of the event in a simple and direct manner. Based on the example provided, you can easily relay a message to those concerned by writing a copy of what you mean to say. In a galaxy far, far away, some intergalactic creatures might be keeping a close eye on your upcoming marriage to another human being. 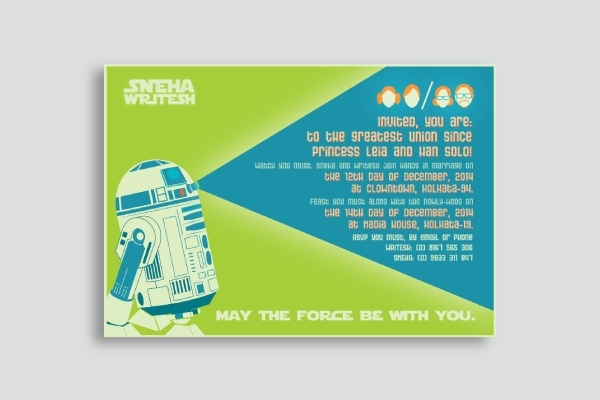 To inform your extraterrestrial friends and fellow anthropoids about the union, you can take inspiration from the famous space movie Star Wars for the main theme of your announcement card. You can upload the announcement on your social media profile or mail a copy of the announcement to your friends and family. It’s a creative way to build a buzz around your event that’s sure to be the talk of the town for the next few weeks. 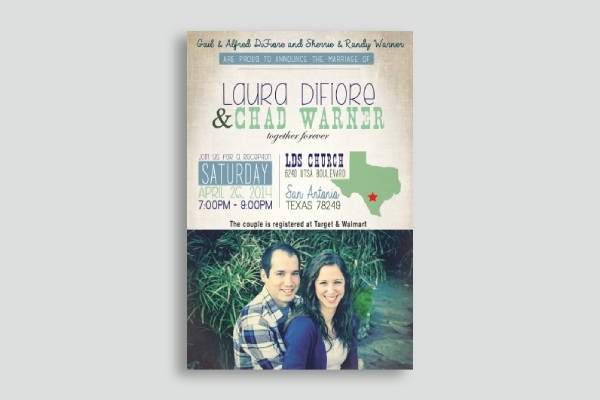 A wedding announcement can serve as a wedding invitation in itself. Key details of your ceremony and reception should be indicated in the announcement, including the date, time, and venue of the event. You can even include a photo of you and your partner as a keepsake for your special day. Make sure that the information included in the announcement card is accurate and updated before being sent to recipients to prevent any problems from occurring. While it might require a good amount of time and energy to invest on, crafting an announcement that’s out of the ordinary can keep your wedding on top of a person’s mind. 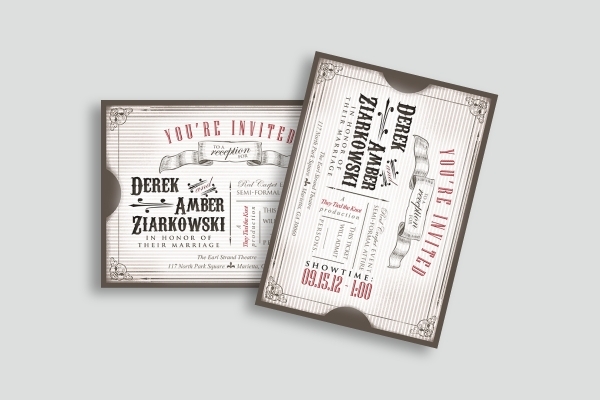 The invitation ticket presented above is perfect for expressing your creativity through its rustic design and eye-catching details. You can use the ticket to announce and invite people to the celebration in the most imaginative way possible. 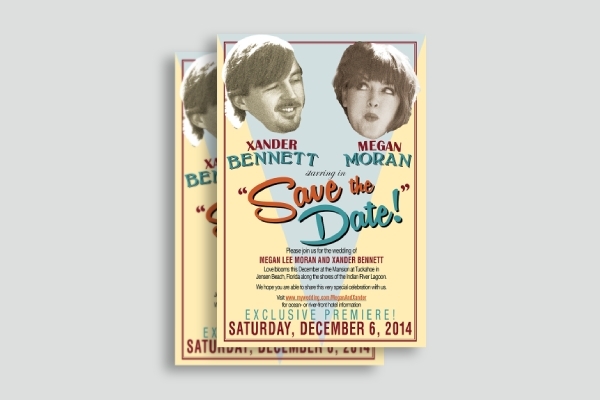 Shown above is an example of a save-the-date wedding announcement which you can use to inform others about the details of your wedding. This design resembles the elements of a poster for a famous movie, giving your announcement a vintage appearance that will definitely leave a positive mark with guests. Make sure to provide your contact details for recipients to know how they can get in touch with if they have any questions or concerns to raise. Wedding cards are perfect for couples who are looking for a simple way to announce their marriage to anyone in their inner circle. 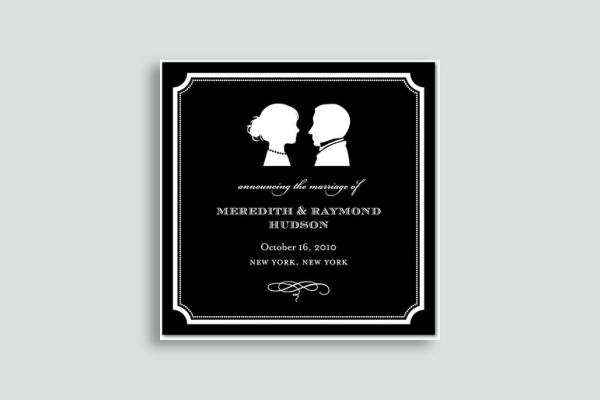 This classic silhouette of a couple offers a timeless look for your announcement, which is great for feeding into that old-fashioned vibes to complement the theme of your event. Using a monochromatic layout can also be a money-saving option in terms of print production. Most printing firms offer their services at a cheaper price when colors aren’t as vibrant as usual. This allows you to save enough money to spend on other essentials while sticking to your wedding budget.